The first flash drive was tested in our lab one and a half years ago. Over a year ago we reviewed the Apacer HandyDrive - a flash drive of the second generation that didn't require installation of additional software in modern operating systems. Since that time these devices have covered a long way - the speed and capacities have been growing, the prices keep on falling, it became possible to boot a computer from a flash drive. No wonder that the new drives got a lot of fans. But there are some problems which do not let the drives to gain more popularity. The main difference is that here the drive is combined with a data carrier in contrast to drives on removable discs. It makes the device very compact but if the speed and capacity of you drive do not suit you anymore, you will have to replace the whole device or get a new one in addition. In the first case you will spend more money, and it's unknown whether it will be possible to sell the old one well. In the second case you will anyway spend too much because the old drive does cost something. The wayout is to have a separable device. If you need more speed than the USB 1.1 offers - you just replace the drive without changing the flash memory (which is still not cheap). If you are short of memory - you just get some more separately. Card readers are deprived of this problem, but they have their own quirks. They are bulkier, the speed of many models is not that brilliant. Besides, the cost of a separable solution is higher. In all other respects, they are perfect devices. Also, there is one more advantage - memory cards can be used not only for carrying data, and one may even save some money with them. 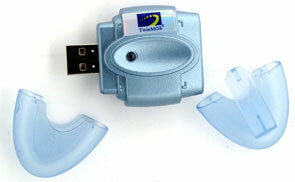 That is why the portable card reader TwinMOS GoGo Egg attracted so many attention at once. First of all, it is compact as it deals with MMC and SD cards which are the smallest cards on the market. 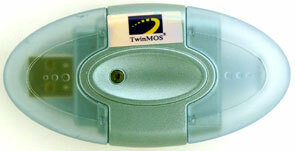 Secondly, it's not expensive: the reader comes with a TwinMOS MMC card, and the tandem of a 128 MB card and the reader is only a bit dearer than the card itself. So, if you need a memory card, it makes sense to get the card reader as well. If you don't need this card, the device will attract you anyway: starting from the memory size you need (e.g. 16 MB), you can then easily extend it: MMC cards vary from 16 to 128 MB and SD reaches 512 MB (the cards of 1GB and over are expected soon), and you won't have to get rid of the cards bought before. Well, let's see whether this egg can really satisfy our needs. 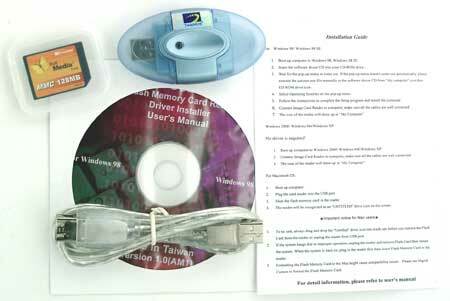 The package is plastic like that of many other flash cards and flash drives. Its contents is similar to the TwinMOS Mobile Disk: the drive, a very brief printed manual, a CD with drivers for Windows 98 and user manual and a USB extender. 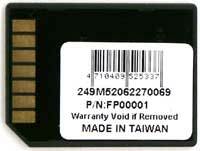 In additional there is an MMC card of 16, 32, 64 or 128 MB (the drive also supports SD, but this type is more expensive and has no advantage over MMC in case of USB 1.1, which was shown lately). The cheapest packing is when the card is put into the drive, but the manufacturer packed it in a separate plastic case standard for MMC/SD. The device reminds a swollen flash drive. It is 80 mm long, 40 mm wide and only 20 mm thick. The length and thickness are similar to flash drives, but the width makes almost impossible to install the drive into the USB port on a mainboard. In principle, the device will easily go into an external hub, a port on the front panel or a tip-up panel, but in this case one or two neighboring ports won't be accessible, that is why the extender is supplied. In contrast to flash drives, there are two detachable roundish semitransparent covers. One has a belt clip (though such way of wearing is not fully reliable), but on the whole, they are easily interchangeable. They are well attached to the new device, can be easily taken off if you press a little on their sides, but they can loosen with time. Without the covers the device doesn't look so nicely roundish and reminds a smaller version of a usual card reader. Instead of cables it has a USB port like on flash drives. On the other side there is a MMC/SD slot. It's just a slit - nothing that would help to fish out a card. However, it's not supposed that you will replace cards often (especially if you are going to use them exactly for carrying over data. Above there is a LED that notifies about the drive's operation. Next to it is a small sticker with the TwinMOS logo. The connection to the computer with Windows XP was trouble-free. 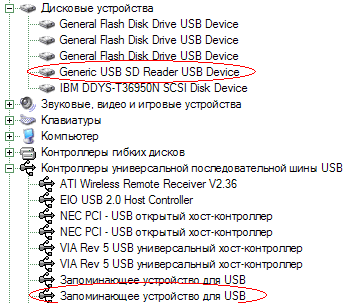 The list of USB controllers got one more memory device and the list of disc devices got Generic USB SD Reader. In the tests we used the 128 MB card supplied, a 128MB MMC from Simple Technology (which showed excellent scores in the card drives tests) and a PQI's SD card 128 MB (not very fast but suitable for checking up compatibility with SD). First off, the access time. All three cards show similar access time about 6-7 ms. Well, not bad. What's about the speed? We knew that the SD card had a low write speed. But it reads quite efficiently, and the speed is limited only by the throughput of USB 1.1. Both MMC cards behaved perfectly, being limited by the bus in writing as well. The MMC card which is supplied with the reader is especially good - TwinMOS seems to make brilliant MMC cards which outdo the others in speed (at least, in case of USB 1.1, but I can assume that in case of speedier interfaces they will retain the leading position). The further speed growth is possible only with the USB 2.0, but today it will affect the price. Is it really necessary? It will take less than 3 minutes to fill up 128 MB at 830 KB/s. It's quite acceptable. And there is only SD which can have a greater size, but the SD hasn't reached the limit of even the USB 1.1. Now let's compare the speed of the compact card reader with the flash drives we tested before. We will take the read/write results shown by the GoGo Egg with the TwinMOS's MMC as they are best. The access time is comparable to the fast flash drives and is much better than that of slow models. The gap of 1 ms is caused by the card - with the ST's card it would be only 0.1 ms. The hour of triumph of our hero! In reading the breakthrough from the leaders is not great, but it still exists. In writing the drive outscores even the best flash drives, that is why the victory is full: with respective memory cards this is the only device that raised its speed over 800 KB/s. By the way, it has beaten the devices with the OTi's controller - the flash drives based on the SSS chip lag behind by more than 1.5 times. Of course, the scores can be poorer with other cards, but you can always count on these ones as they are obtained with the card coming with the drive. So, the speed is really high. It has a separable design so that you can add more memory by getting new cards. Besides, it's easier to part with this cheap drive when moving to the USB 2.0 than with an expensive flash drive. The drive will be very useful for those who are going to use cards of this type only only for carrying data. Imagine you are buying a player based on flash memory. Realizing that 128 MB is not enough both for music and data and not feeling any desire to carry special software and drivers with you all the time, you are going to buy something separate for carrying usual files. In case of a flashdrive its memory will rarely be used entirely. But in case of a player with the MMC slot and the GoGo Egg coupled with the card you will never waste any precious "flash" byte. The card will mostly be used for music, and when necessary, you will just take the card out of the player and put it into the Egg getting a high-speed drive. By the way, the cost of such tandem will only slightly increase that of the card itself, and thus you can save a bit on the player's memory. Note that if the player works with a standard file system (most MMC based models do so), you can use the drive for recording music at a speed higher than provided by the player: 800 KB/s is supported by none of them, and the card's write speed is low at all (for example, the Digital Square Zillion records MMC actually at 135 KB/s, i.e. too slow). But are there any downsides? Well, first of all, the device is much less compact than flash drives, especially in width. Most flash drives can be inserted into a standard USB port on a mainboard, in contrast to the GoGo Egg. Also forget about booting from it. SSS based models can be easily become bootable under any operating system (drives of the latest generation have wonderful flexibility: you can make one partition bootable as USB-FDD and the other as USB-ZIP and protect it with a password); besides, it's very easy to boot from them. But you will hardly ever boot from the Egg. Moreover, no data protection, even with a password. In principle, you can protect you files using additional utilities but... It will take much more time than simply run a small utility from a manufacturer's flash drive. And it's not so handy. In general, the device has both strong and weak points. It is for you to choose, that is why you have to decide what outweighs for you. 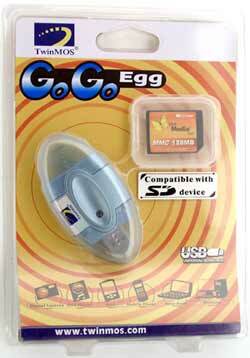 But undoubtedly, the GoGo Egg is a very interesting and useful solution deserving attention and maybe even purchasing.